You can also read this article in Brighton and Hove News. Councillors and activists urged Brighton to love not hate on a rainy Tuesday evening at the Level days after Britain voted to leave the European Union. Brighton joined many other cities across the country Standing Together alongside the people of Europe and peacefully but proactively reflecting about the future on Tuesday 28 June. Stand Together organisers said the rally was about moving on from the In/Out campaign which divided Britain and trying to rebuild unity and find positive ways forward regardless of whether people voted in or out. But feelings did run high. Green councillor Tom Druitt said he was concerned that the vulnerable will be hardest hit by Brexit. He said: “I was angry. Angry that so many people had been duped by a pack of lies. Angry that the right-wing media had perpetuated the myths so wilfully and effectively. Mr Druitt’s initial solution was to give a stranger a hug and then campaign peacefully for the loving, welcoming, open community of Brighton and Hove and beyond. Councillor Inkpin-Leissner, a German EU citizen, urged all residents to channel their anger and love one another. He said: “It was mentioned that we have to fight the right wing movement. Yes we do. But let me make this very clear. “When we had right wing marches in Brighton I witnessed violence. Not only from the right wing but as well from the so-called antifascist movement. I cannot and will not stand for that. “This violence is wrong, may it come from the left or from the right wing. I cannot support this. Violence is always wrong. “How do we make our little community safe for everyone but more importantly our global community? I’m not going to tell anybody how they should feel, whether they should respond with Love or with Anger, or a mixture of both. “There’s a place for solidarity and love but righteous anger needs to be acknowledged too. “I’m not going to tell you what your tactics should be. Each other’s tactics are not the problem. “But I do believe that we can do more than shout ‘not in my name’. We can organize on whatever levels, in our everyday lives, on the streets AND in mainstream politics. “We can refuse the divisions that have been imposed upon us. We can insist that we all get the world and community we deserve. Chair of South Downs Liberal Youth Drew Miller-Hyndman said: “We attended the rally today, not only to affirm our support for the UK remaining in the EU but in solidarity with EU migrants who have faced unprecedented hatred in recent days. Green councillor Phelim MacCafferty said Brighton’s two universities will lose £730 million a year of EU research funding for future scientists, medics and engineers spelling disaster for the local learning economy. However, he encouraged Brighton to stand firm: “Acts of kindness that bind us together as a community have never been more needed. Those at the sharp end of the fear and scaremongering need our support… It is no longer acceptable to remain quiet or walk to the other side of the road if we hear or see prejudice, xenophobia or racism – all of us must challenge them directly. There is an anti-racism demonstration this Sunday 3 July. Supporters are asked to gather at the Level at 12.30pm. Labour MP Jo Cox was tragically stabbed outside Birstall public library, West Yorkshire in broad daylight where she was about to hold a surgery for constituents on Thursday 16 June. This incident has cast a shadow over the EU referendum campaign and led to an all too temporary pause in campaigning and a period of sober reflection. It is into this well of hatred that Nigel Farage, Leader of UKIP, speaks. He tells us he is the man in the pub to whom everyone can relate. Do not be deceived. An hour before Jo Cox was killed, Mr Farage unwittingly launched a referendum poster entitled Breaking Point showing a steady stream of refugees flooding into Britain coupled with a call to take control of Britain’s borders. However, he then has the audacity to accuse the Prime Minister days later of playing “despicable” political tricks in the wake of Mrs Cox’s death. In fact, Mr Cameron was speaking in support of Jo Cox, a seasoned campaigner with many years’ experience at Oxfam. She campaigned about Syrian refugees and other destitute peoples with authority. Mr Farage accused the PM and Remain camp of misrepresenting the motives of many British people who simply want control of their borders. Unfortunately polls indicate that while economic arguments may have the greatest significance and impact if Britain leaves the EU, it is immigration above all other issues that determines how people will vote. Britain must decide whether to embrace the European project and the multiculturalism that has made her great or whether to become “little England” with Scotland once more seeking independence and the future of Northern Ireland uncertain, border controls reinstated. The EU is the most advanced and successful form of cross-border cooperation that the world has ever seen, empowered to manage the power of multi-nationals and mitigate climate change. He is an individual and it is highly likely that he is unwell but his statement indicates a fractured society. While the conservatives make the case for national sovereignty and freedom to trade with countries beyond Europe and forge new agreements; UKIP always campaigns about controlling Britain’s borders and in this case closing them to Turkey. The NHS alone would be on its knees without foreign nationals and immigrants working at every level of the health service. About the referendum, tellingly Mr Brown said: “The business of politics has become more about the exploitation of fears than the advancement of hope.” While the Remain campaign is accused of “Project Fear” it is UKIP that exploits fears about immigration mercilessly, fears about jobs and pressures on public services. The EU provides jobs, about half of UK trade, national security and allows free movement of labour for the British to work in Europe as well as Europeans to work here. Britain is sovereign within Europe and is part of a 28 strong trading family. She would still have to apply EU rules to retain access to the single market if she leaves the EU. “If Britain votes out, it is irreversible”, Mr Cameron said. Vote remain. The same article is published on the News Hub here. Mr Hickey was speaking to staff from the Universities of Brighton and Sussex who gathered at the Old Ship Hotel on Wednesday 25 June for the first of a two day strike. Mr Hickey condemned the “disaggregation and destruction of national common education available to everyone.” He will publish an alternative white paper next week. Law Lecturer Tom Frost from the University of Sussex did a quick key word search of the white paper and found the words “competition” and “markets” mentioned 50 times each while “lecturer” and “academic freedom” were only mentioned once each. Members of UCU, the University and College Union were striking about changes to their terms and conditions including a pay rise of 1.1% compared with 6.1% pay rise awarded to vice chancellors. Some university staff are on zero hours contracts which Mr Frost says is unacceptable given the £1.8 billion of reserves. The union is campaigning for secure, permanent jobs and an end to casual employment. Research by UCU estimates that 48.7% of staff across the UK higher education sector are employed on some form of casual contract. A university spokesperson said: “The University of Brighton is bound by national agreements and cannot negotiate or settle pay claims outside of this arrangement. The unions locally and the University of Brighton agreed to be part of national pay negotiations. However, protestors are also campaigning to close the 12.6% pay gap between men and women by 2020 which is the 50 year anniversary of the Equal Pay Act. A spokesperson from the University of Sussex said: “The University of Sussex strongly supports and is committed to equal pay for its staff. “That is, the White Paper approaches education as an opportunity for profit. And education should not be about profit any more than it should be treated as a game – as you all know it’s about much more than that. It’s about a future for students and jobs and innovation, of course but within a solid future for the UK’s skills base and for the quality of citizenship. “Education is about world-class teaching and research that can keep such a status only if staff and students are given the much-needed “academic freedom” that’s needed as a bedrock, rather than ultimatums around maximizing profit. “And, of course, there’s a more practical aspect if there’s to be a real future for higher education, and that’s the need for fair pay, and for employers to take meaningful action to end casualization and the gender pay gap. “This is badly needed so that university staff can afford to continue their excellent work, and so that students can realistically consider roles in higher education and academia as a future career. Brighton and Hove Buses did not stop at the Universities on Wednesday morning in solidarity with academics on strike. Students studying moving image and photography are holding a show from Saturday 4 June to Sunday 12 June at the University of Brighton site on Edward Street. An edited version of this article was published by Brighton and Hove News here. In Britain we associate camping with a rustic retreat into nature from our manic and sophisticated lives. For refugees fleeing political persecution, camping in squalor is a way of life. Most of them do not want to leave their homeland, under six percent reach Europe. They arrive in refugee camps traumatised, alone and hungry. Brutalised by war and disorientated because they do not speak the language, they do not understand the culture and they do not know whom to trust. Women have often been raped in front of their husbands or male relatives and children are suicidal and starving, they fight to survive. Refugees must compete for food, water to drink and bathe and battle to become legal citizens. Without passports refugees are not allowed to return to their homeland, even if family members remain there, without permission from the Home Office. They have already left their family, friends, homes, possessions and above all their dignity. It is possible that even their jewellery, their only portable possessions, may be taken from them, if not by robbers then by the authorities to pay for their stay. Refugees stop being citizens and become stateless aliens in a foreign land where the government sees them as a problem rather than a person. They are stripped of their humanity by the immigration authorities who interrogate them relentlessly. While necessary, it must feel like an assault on an already battered psyche, the final straw tipping them over into a temporary insanity haunted by the hell of going back to their homeland. Countries in the West have the opposite problem. Many argue that Britain is a densely populated island, the green fields are cultivated for farming. We are told hospitals are at breaking point and schools and the welfare state are stretched to capacity. Refugees who do not speak English are particularly vulnerable to exploitation and must be protected under the UN Geneva Convention of Human Rights. Generations of indigenous, white British people living in overcrowded, dilapidated council and housing association flats are trapped in low income jobs or unemployment. They resent the refugees who sometimes take priority on the housing list because they are homeless or temporarily housed in a detention centre. The refugees are grateful for any shelter but the poverty, language barriers and mutual mistrust can prove to be a fatal combination setting neighbours against each other and fracturing the heart of communities. Grace Eyre and Speak Out launched their campaign to: “Stop the cuts!” to disability benefits in Hove on Wednesday 16 March. Grace Eyre is a charity which works with adults who have learning disabilities. Their latest campaign focuses around Ann and Margaret who are no longer allowed to go to see their friends at Grace Eyre. You can watch this video to hear their story of frustration, loneliness and boredom since they received letters telling them not to come to their daycentre anymore. A lot of other members of Grace Eyre are very frightened that the funding for their places will be cut too. Johnny Schachter criticised the Government for spending so much money on a new airport and on MPs expenses instead of helping people with learning disabilities. You can watch the joint campaign group’s presentation here. Hove Councillors Phelim MacCafferty and Lizzie Deane from the Green Party supported the launch at Grace Eyre. Former leader of the Conservative Party Iain Duncan Smith yesterday (Friday 19 March) resigned from the Cabinet because of Treasury pressure to make cuts to benefits for disabled people. This prominent resignation of a minister follows mounting outrage from grassroots campaigners across Britain including Grace Eyre and Speakout who have been campaigning since 2013. “I have for some time and rather reluctantly come to believe that the latest changes to benefits to the disabled and the context in which they’ve been made are a compromise too far. While they are defensible in narrow terms, given the continuing deficit, they are not defensible in the way they were placed within a Budget that benefits higher earning taxpayers. They should have instead been part of a wider process to engage others in finding the best way to better focus resources on those most in need. “I am unable to watch passively whilst certain policies are enacted in order to meet the fiscal self-imposed restraints that I believe are more and more perceived as distinctly political rather than in the national economic interest. Too often my team and I have been pressured in the immediate run up to a budget or fiscal event to deliver yet more reductions to the working age benefit bill. There has been too much emphasis on money saving exercises and not enough awareness from the Treasury, in particular, that the government’s vision of a new welfare-to-work system could not be repeatedly salami-sliced. Mr Duncan Smith has voted with his feet. The question is: Will the Prime Minister and George Osborne listen? Planners have thrown out a hotel scheme put forward by Brighton and Hove Albion in the grounds of the American Express Community Stadium in Falmer. One councillor dismissed the design as “mediocre” when the plans went before the Brighton and Hove City Council Planning Committee at Portslade Town hall today (Wednesday 17 February). The decision was made on the casting vote of Councillor Julie Cattell, who chairs the Planning Committee. It followed an application by Albion Sports and Leisure, a subsidiary of the football club, to build a hotel with 150 bedrooms. The scheme included a restaurant, bar, gym, meeting room, lounge, garden area, 62 car parking spaces and a cancer treatment centre. A report recommended that councillors refuse planning permission because of the design, closeness to the stadium (14 metres) and the inappropriate architectural impact on Stanmer Park. Councillor Adrian Morris, a fellow Labour member, said: “There are huge economic benefits. The Albion do a lot for the city but we cannot treat them any differently. “I have to agree with the officer’s recommendation about design. We need the development but it is what standard of design that we need to achieve. Councillor Pete West raised environmental concerns. He said: “We do have a stadium and it does have architectural merit. The visual impact is important and the national park that surrounds this site. Speaking in support of the development Councillor Carol Theobald, a Conservative, said: “The building has a nice curve. I regret the loss of car parking. 156 spaces is rather a lot. I do see there are only two objections. Given the no vote, the committee appears to believe that the tarmac is more appealing for now. This article was first published in Brighton and Hove News on Wednesday 17 February. You can read the same article here. The Float Spa won the Best of Brighton “Star Business Awards” because it is a leading centre for health and wellbeing. The spa has state of the art flotation pods, complementary therapies, yoga and meditation classes. It is based on Third Avenue in central Hove between Church Road and Hove Lawns and the seafront. Camille Pierson, managing director of the spa, said: “At the Float Spa we pride ourselves on good customer service, and being part of the Best of Brighton awards has enabled us to gain valuable feedback from our treasured clients. The Float Spa supplies everything needed for the flotation visit, including complementary towels, shampoo, conditioner, body wash and earplugs, as well as a vanity room equipped with hairdryers. Customers enjoy a free home-made sorbet and herbal tea in the relaxation area to refresh and rejuvenate afterwards. The flotation experience lasts 90 minutes. The Fairy Tale Fair was voted second in the Best of Brighton awards. It is run by Claire Montgomery. 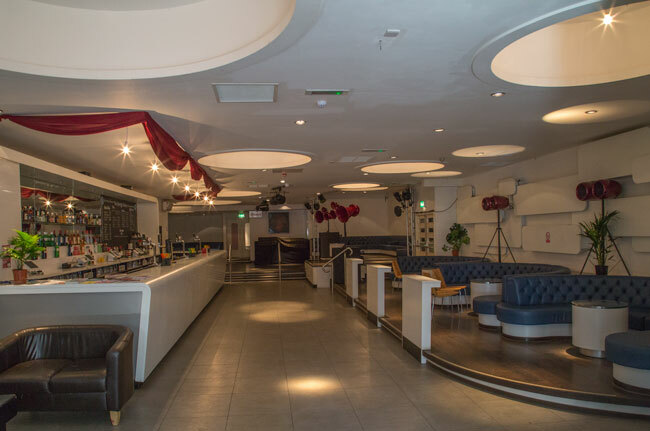 She said: “As a Best of Brighton and Hove member we were excited to take part in the business awards. “Gaining stallholder and customer reviews is an important part of our business as our fair relies on a good reputation to get customers through the door and new stallholders taking part. The Fairy Tale Fair was voted the third best community event in Sussex 2015 in the Argus Community Star Awards and the fairs have gained “recommended by parents” status on Kallikids Sussex since summer 2015. The next Fairy Tale Fair will be an Easter fair held at Patcham Methodist Church on Saturday 5 March and the Patcham Easter gift guide 2016 is available online. There are quality crafts designed and produced in Brighton and Hove in abundance. Face painting, charity raffles and a tearoom with homemade cakes provide a fun, family-friendly day out. In third place BBZ Brighton in Air Street, Brighton, is a fitness shop selling training equipment including for yoga, gyms and martial arts, clothing, accessories and dietary supplements. They also offer friendly, expert advice about dieting and workouts. The Float Spa was voted best star business by Best of Brighton customers with 157 verified votes, followed by the Fairy Tale Fair with 83 votes and BBZ Fitness shop was highly commended in third place securing 42 verified votes from customers. The customer votes or reviews for the Best of Brighton Business Awards 2016 were counted from 1 March 2015 and businesses needed at least 12 verified reviews to qualify by the last day of December 2015. The campaign kicked off in earnest at the beginning of January this year. Businesses competed to collect as many additional reviews as possible in a month until Sunday (31 January) when the votes were counted. You can read the same article first published on Brighton and Hove News website here. This article was first published in Brighton and Hove News: read the full article here. Residents of Brighton and Hove have 26 days until Tuesday 16 February to express their views about the late licence application from the Synergy Centre in West Street. The centre has met with some resistance from the Sussex Police licensing team who view the Synergy Centre as a live music venue. The Synergy Centre sees itself as a multimedia arts centre doing charitable work. Synergy Centre director Steve Peake said: “While some elements of Synergy’s application look like a live music venue, other elements look like a poetry salon, or a dance studio, or a youth club, or a conference centre, or a homeless drop-in centre or a youth skills-raising facility, etc. The vision of the Synergy centre is to use creative, multimedia events at the weekends to subsidise work midweek with disadvantaged groups including the unemployed, homeless people, those with mental health problems and substance misuse issues. A licence is needed to sell alcohol at any time, to sell refreshments including soft and hot drinks after 11pm and to provide entertainment after 11pm. Mr Peake argues that Brighton lacks a medium-sized live music venue which prevents many bands from visiting the city and boosting the economy. The Synergy Centre is bigger than Concorde 2 and smaller than the Brighton Centre with a capacity of 800 to 1,000 people. Sussex Police has concerns about another live music venue in West Street. They operate a policy of containment and are concerned about another late-night entertainment venue in the area which is in a “cumulative impact zone”. The previous licence was surrendered when the occupiers had to leave. You can sign the online petition which has attracted more than 1,900 signatures in support of the Synergy Centre here, hosted by change.org. You can write to Sussex Police and Brighton and Hove Council Licensing Committee to express your views before Tuesday 16 February when the consultation closes. First published in Brighton and Hove News on Saturday 23 January. Read the full article about the Synergy Centre here. 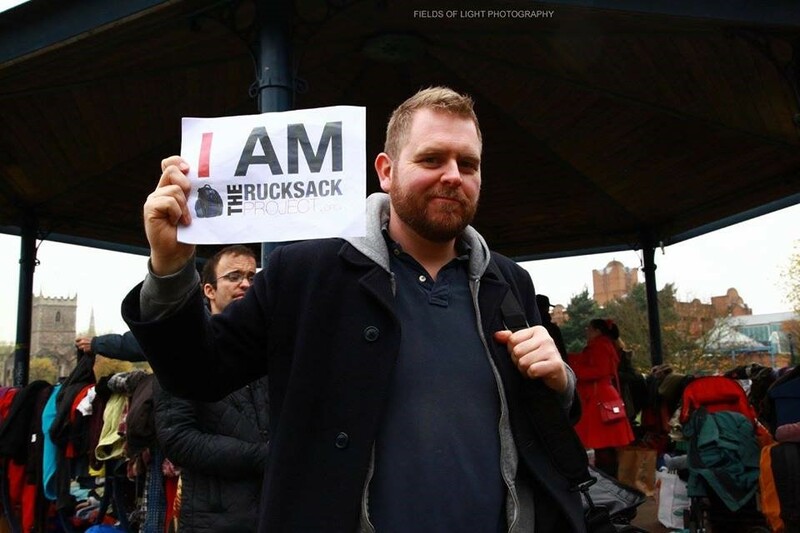 Businessman Mathew White set up the Rucksack Project because he wanted to do something without reward instead of getting caught up in the commercialism of Christmas. The idea is simple – fill a rucksack with items listed on the project website or Facebook page and give it to a homeless person. No money changes hands, the project deals with donated goods (hat, gloves, scarf, sleeping bag, etc) often bought from charity shops. Mr White explains how he had the idea: “As I came out of the underpass, I saw a stark image of a forlorn homeless guy. I did not speak to that guy but that afternoon I bought a rucksack. I went to the local YMCA in Nailsea, Bristol, and told them what I wanted to do. They were very generous with the pricing and a disabled lady paid for two fleeces. I paid £18 for two rucksacks (including the contents). “The homeless man I saw before had gone but two others were there. I gave them the two rucksacks and they were so grateful. It’s nice to do something for charity but don’t brag about it. Over seven years, Mr White estimates that 100,000 rucksacks have been given out. Mr White’s next challenge is to raise £5,000 through Indiegogo’s crowd funding website within 60 days to develop an automated website with a database. Indebted to the local organisers who are volunteers and to Facebook, he said he wants them to take the credit in their areas. Cassie Evans co-ordinated the project for Brighton and Hove on Facebook and held an event for people to drop off rucksacks on Saturday (12 December). Ms Evans said that one homeless man cried because he was carrying all his things in plastic bags. He couldn’t believe the whole rucksack was for him. Many people did not want publicity, they just wanted to give something to the homeless at Christmas. 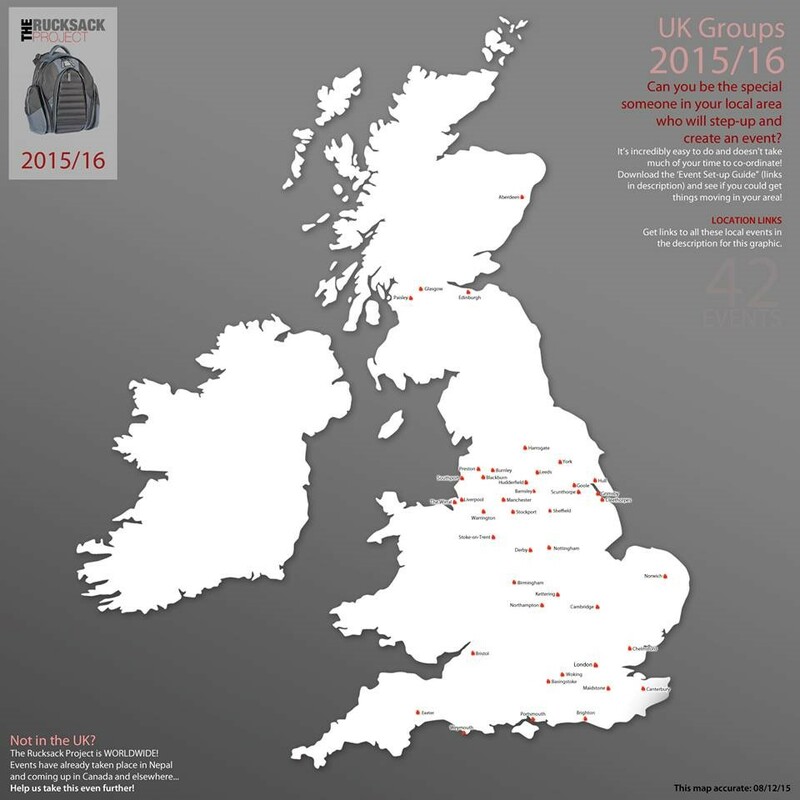 Maria Garrett helped Ms Evans distribute the rucksacks and leads Opsafe Brighton which is a grassroots activist network. Ms Garrett puts together survival packs for the homeless and those most in need in society. She said about the rucksacks: “People have put in poetry, cards, they have made things. People have gone out of their way to put in personal extras. All donations have come through our own community. That’s really beautiful. “Social attitudes towards homelessness are changing. The campaigns are working. The government is not stepping up to the mark. The system is designed to fail so change has to come from within the local community. She wants to work together with others to eradicate rough sleeping all together. Glen has been running a campaign to get himself off the streets by using Facebook, twitter and online crowd funding. He has raised £15,000 and has found a boat to buy in Menorca. He has now applied for a passport and is raising money for the mooring fees. He will stay in Menorca until he has paid the fees and then meet a friend in Barcelona who will help him sail the boat back to England. This article is reproduced in full here but was first published in Brighton and Hove News on 14 December. Hove residents gathered in force tonight (Monday 7 December) to express concern about a proposal to build a 17-storey tower containing 107 flats on the corner of Sackville Gardens and Kingsway. Angelique Henderson, chair of the No To Sackville Tower campaign group, said: “We have only known about the plans for a couple of weeks and already more than 300 people have joined our campaign on Facebook. “It’s not just residents of Sackville Gardens who are opposed to the tower – people from across Brighton and Hove have told us how worried they are. “The council’s own planning guidance on tall buildings is based on a detailed independent study which categorically excludes Sackville Gardens conservation area as a zone appropriate for a high rise. “We ask that whatever is proposed is of high architectural quality to enhance the area. “The No To Sackville Tower committee would be fully behind a proposal of suitable height and design by an architectural firm with a track record in producing award-winning buildings. Hove Labour MP Peter Kyle backs the residents’ campaign and said he feared that the apartments would be too expensive and that the flats would be bought mainly by property speculators from abroad which would price yet more local residents out of the market. Westbourne ward councillors Denise Cobb and Tom Bewick also feel the proposed tower is out of keeping with the neighbourhood. Mrs Henderson and Valerie Paynter from Save Hove have started a petition which they hope to take to Brighton and Hove City Council when the full council meets on Thursday 17 December. They are petitioning for a planning brief – the rules of engagement for a particular site. There is broad agreement that the site needs to be developed but residents want to limit the height of any new-build which they maintain should be no higher than the existing buildings. The full article was first published on Monday 7 December in Brighton and Hove News. Soaking cyclists, wet but exhilarated, huddled into the Brighthelm Centre after braving the elements on their first leg of a four-day journey to Paris. Together they will cycle 25,000 miles. 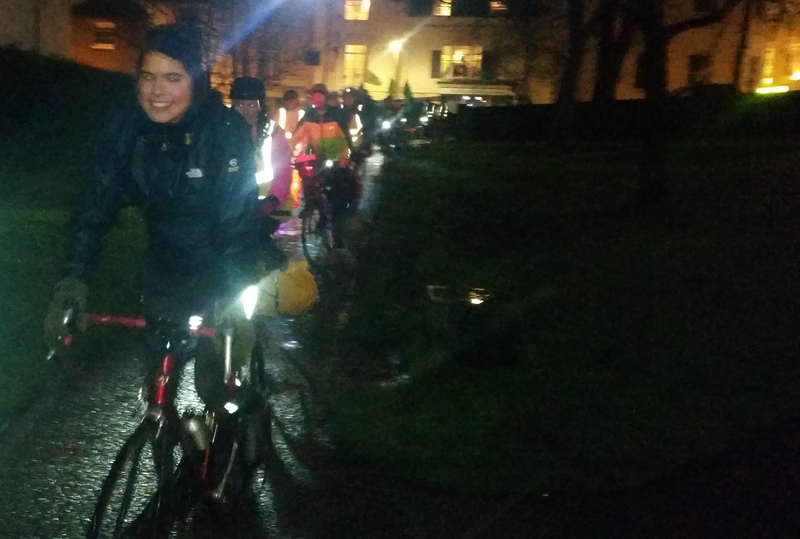 Cyclists of all ages and from all corners of the country met in London – they came from Bristol, Cambridge and Scotland – and rode through snow and at night all week to reach Brighton yesterday (Sunday 6 December). The team will have flags and a sound system as well as a slide show of images projecting photographic messages on to buildings when they arrive in Paris. He said that environmentalists have been engaged in this struggle and campaign for climate change for 20 years. 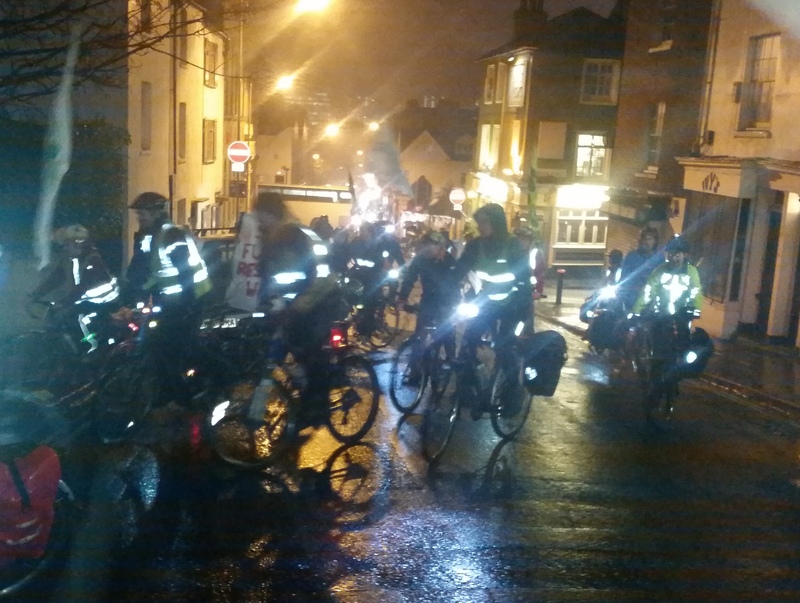 The cyclists were greeted by Caroline Lucas, the Green MP for Brighton Pavilion. She said: “It is wonderful to feel the energy and excitement in the room. It is sheeting down with rain and the cyclists are taking inspiration from each other. “We need to wake up and shift to a zero-carbon world. Whatever you do, you think it is not enough. Small differences make a difference. Be empowered to have a conversation. “Instal solar panels, eat less meat, recognise the need for public transport. There is value in all of those options. “Do what you can. Don’t do nothing. You can’t do everything. When asked about the talks under way at the Climate Change Summit in Paris, Caroline Lucas said: “There is no binding agreement to keep the temperature below at least two degrees, no commitment on finance and no compensation to poorer countries. The Reverend Alex Mabbs, minister of the Brighthelm Centre with a specific responsibility for climate change, welcomed everyone including a team of cyclists from Edinburgh and said that a couple had cycled all the way to Paris from Vietnam. He said: “Who needs a third runway at Heathrow when we have a bike? We choose co-operation and peace. There is a depth of community here that we didn’t know was possible. First published in Brighton and Hove News on Monday 7 December, read the full article here. In response to the spate of terror attacks by ISIS culminating in Paris on Friday November 13, I consider how the UK should respond. My article about terror in Paris was first published in Brighton Argus on Tuesday November 17. THE UN must endorse military action to eradicate Islamic State (IS) and broker peace in Syria. Paris suffered a vicious assault on its democracy, culture and young people, innocents caught in the crossfire. Meticulously planned, indiscriminate violence. French military action in Syria is a likely motive. Read a longer article here about the need for a coherent diplomatic and military strategy involving the UN to defeat ISIS. First published on the News Hub on Thursday November 19. This is the second terrorist attack on Paris this year. However, the earlier attack at the offices of Charlie Hebdo was provoked by inflammatory cartoons ridiculing Prophet Mohammed and targeted. Read my article about Charlie Hebdo here. Last Friday’s attack was on a far greater scale. President Francois Hollande said the attacks were “an act of war”, echoing George Bush’s “war on terror” after 9/11. This is playing into the hands of the terrorists. Diplomacy, better relations between the US and Russia and, above all, endorsement of all military action by the UN are the best hope of eradicating Islamic State and negotiating peace in Syria and Iraq. Arab states, Arab Sunnis, need to participate in all military action because Nato and Western democracies are the enemy of IS and thus unable to broker peace alone. The mistake in Iraq was to invade without UN agreement. MPs voted against military action in Syria in 2013, shaken by the bloodbath in Iraq and their part in it and Islamic State gradually filled the vacuum left when Saddam Hussein was deposed. Labour MP Peter Kyle for Hove voted in favour of air strikes in Syria. Read what he said here, first published in Brighton and Hove News. Hundreds of children and young people, mainly girls, are being admitted to hospital every year as a result of self-harming. They have to wait up to 18 weeks for a referral to Child and Adolescent Mental Health Services (CAMHS) and up to 8 weeks to see a school counsellor after they have been identified as needing help. The number of young people self-harming has risen by 40 per cent in just a few years, with 281 under-24s admitted to hospital in 2012-13. Read the full article in Brighton and Hove News here. Tenants across Brighton and Hove are struggling to pay their rent because the city is a “low wage economy with excessively high property costs”, according to a council housing committee report. The Living Rent Campaign petitioned councillors last year asking them to support the aim of keeping rents to a third of a tenant’s income. Read the rest of this article published by Brighton and Hove News here. Central government cuts to policing are a concern across the country including in Brighton and Hove. Local Action Teams, part of the Safe in the City Partnership, enable residents to raise concerns about crime and anti-social behaviour with the Police across Brighton and Hove. Francis Clark-Lowes, chair of the North Laine Community Association and Peter Crowhurst, the outgoing chair, are very concerned that the Police will not routinely be represented at future Local Action Team (LAT) meetings. “They can’t set police priorities if the Police don’t attend”, said Mr Crowhurst. Whitehall will centralise education at their peril was first published on the News Hub blog. David Cameron chose a Saturday in August to announce that he would like every existing school to become an academy. Conservative policy is an extension of the previous Labour government’s flagship academy programme for failing schools but it has changed the marketplace. The problem with this policy is that schools are about education and welfare not profit. Successive Labour governments courted the wealthy as sponsors of academies but they did not relinquish their role in education. Head teachers understandably want to manage their budgets but these Heads must be teachers not businessmen. Mr Cameron’s conservative government has abolished the national curriculum for academies and free schools. There will now be no common programme of study and the gap between English exam boards will widen. In Scotland there is one exam board, everyone sits the same exam: there is no two-tier education system. It is fair and transparent. Mr Cameron’s free schools are unpopular because they have often been opened in places where there is a surplus of school places, rather than densely populated areas where schools are oversubscribed. Like academies, free schools are publically funded but they are new schools. Labour research in May 2014 found that only 28 per cent or 49 actual schools, out of 174 free schools, had reached their capacity for first year intake. This means 72 per cent of free schools, or almost three out of four, had spare places during a national crisis where, every summer, parents wait anxiously to find out if their child has been offered a school at all, never mind the school of their choice. It is shameful that the government is funding 1500 empty school places in free schools while other children languish on waiting lists and parents struggle to home school them. Labour and Conservative governments have failed to plan strategically for school places from the time births are registered with GPs. Successful schools, often maintained by local authorities, grow in a piecemeal fashion to meet fluctuating demand. Local Authority schools become impoverished because government capital grants are for academies and free schools only. Local Education Authorities continue to play a key role in admissions. Taking schools out of local authority control is an abdication of Mr Cameron’s responsibility as Prime Minister and reveals how little his Conservative government cares about public services and, in particular, education. The new world is one where profit matters more than children’s education and welfare. Schools will sink or swim with business people making the decisions and with no prospect of a financial rescue package. Heads will need to manage their budgets, nurture children’s intelligence, give them “roots and wings” and safeguard their welfare. A Conservative government will centralise power in Whitehall without the expertise of teachers on the ground at their peril. Many politicians have lost sight of the need for public services and the national curriculum. Tenants who privately rent are at the mercy of letting agents because agents need the business from landlords and offer them incentives. 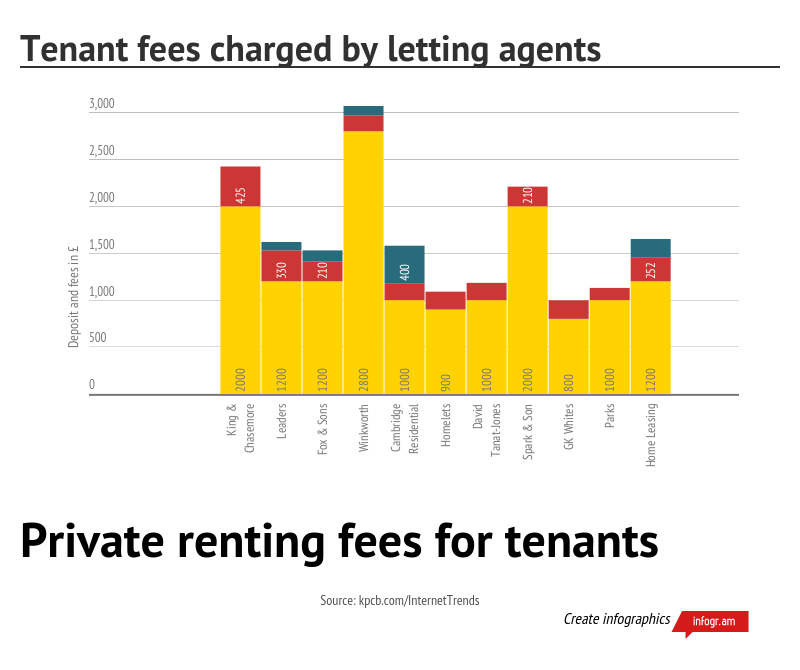 The agents are increasingly passing their fees onto young people and other tenants with low incomes who are renting privately. He paid a six week deposit in advance for his rental home including a £200 holding fee per person to take the property off the market and £252 for the first person or £384 for two people in administration fees. The fees are not refundable but the deposit is. Mr Bolton is renting a 1.5 bedroom flat with his partner who is a 32 year old lawyer. The couple still had to provide a guarantor who was a property owner in spite of their income and age. A friend of the couple, who has no property owning guarantor, has been told to pay six month’s rent in advance and a two month deposit. “Some letting agents only offer six month tenancies which means there is no security for young families. We are sometimes charged more fees to renew the tenancy,” said Mr Bolton. I am currently working for Brighton and Hove News. 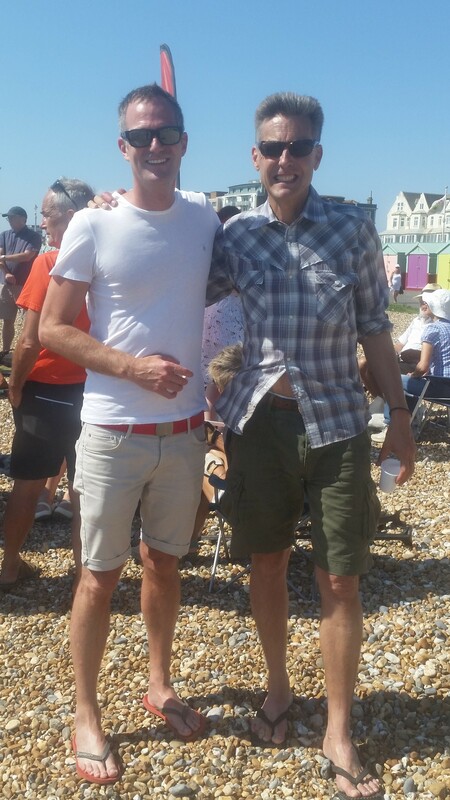 Highlights include deputy leader Ben Bradshaw’s MP to meet Labour Party members in the sunshine over a glass of wine on the beach with Hove MP Peter Kyle. Read the full article here. The Post Office is currently consulting on a closure of the Western Road Post Office in Brighton. Up to 6000 residents of Brunswick have already signed petitions available in the area at City Books and other local businesses. Read about the post office here. Read about students from Patcham High School and Dorothy Stringer Schools exceeding expectations as they opened their GCSE results on Thursday August 20 here. 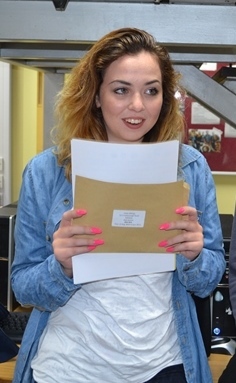 Blatch6 students who took their A-levels at Blatchington Mill School and Hove Park School celebrated their results. RISE Refuge held a food appeal for women and children fleeing emotional abuse and domestic violence. 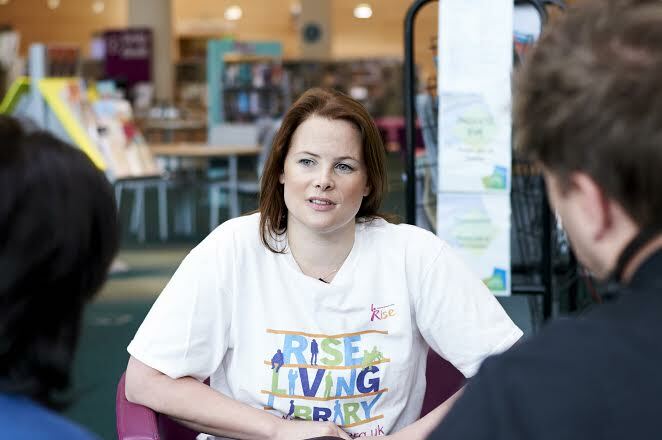 Read the account of Survivor Madelaine Hunter who is now a RISE community fundraiser here. Photographs of graffiti painted in memory of Rapper Sean Price at Brighton’s i360 can be found here. A quirky flea market has closed down in the North Laine but Brighton & Hove City Council’s Planning Committee refused an application to turn it into flats. Read the full article here. Forty disabled people with high support needs may be prevented from remaining in their homes in Brighton and Hove because of the closure of the Independent Living Fund at the end of June. Both Green and Labour councillors in Brighton Hove proposed motions to full council yesterday to reinstate or ring fence the Independent Living Fund for disabled people with the most complex needs. Labour Councillor Hamilton drafted a motion asking for the Independent Living Fund to be permanently reinstated and linked to inflation. Councillor Theobald, Leader of the Conservative group, said there would be no five percent cut by Brighton and Hove councillors and Labour Councillor Hamilton said the fund is still ring fenced nationally. One of Councillor Page’s constituents approached him and said since he had lost his live in carer, he had become a prisoner in his own home and had no quality of life. The Green Party would like to see a stand-alone fund in Brighton and Hove. Section 31 of the Adult Social Care Act provides for the Independent Living Fund and £491,000 has been transferred until March 2016. Councillors who voted against the reinstatement of the fund believe that additional money will not be necessary. This is because of the transfer of almost half a million pounds to the 40 people affected in Brighton and Hove for the next nine months. Full council voted by 26 votes to 23 not to reinstate the Independent Living Fund or ring fence ILF money for individual users in Brighton and Hove until 2019 and beyond. When British tourists die, we glimpse the despair which is a daily reality in many parts of the Middle East and Africa. Up to 30 British people have died in Tunisia, including a Sussex couple, Janet and John Stocker, who are still missing. Nothing detracts from the anguish of their families here at home. The lives of maimed or traumatised survivors and bereaved relatives will never be the same again. Thankfully terrorist incidents affecting British people are unusual. However, we should not be afraid to travel abroad. We must not give in to fear. In Kuwait, 27 worshippers died and 227 Muslims have been wounded as they prayed for mercy, safety and comfort. For them, there is no escape from gunfire and growing regional instability. For them, there is no flight home. The intractable problem is how to protect the essential right of peaceful Muslims to worship; and stamp out distorted religious extremism that legitimises mass murder. Unfortunately, armed terrorists will continue to recruit impressionable young people and others who feel out of place in Europe, from Mosques. Imams must be vigilant and look after their young people. There is widespread, global concern about militant, Islamic extremists who want to live in an Islamic state, a Caliphate. It is very clear that Britain is a more progressive place because it is multicultural. British security services will always track possible extremists but should not over react and spy on innocent British residents. We must not become a surveillance society. Parliament will decide if further powers are necessary to protect British residents and their independence. This must include freedom from observation. This article was first published in The Argus on Saturday 4th July. Let’s track extremists without being a surveillance society. He was concerned that some politicians, primarily from UKIP, could occupy a place in politics that they didn’t deserve and become an insurgent force. He said that migration should be treated as a blessing, not a curse. He said that he was apprehensive about humiliating the Greek people which may lead to a swing from the far left, Syriza party, to the far right. “Mrs Merkel is potentially stoking a monster that we may not be able to control,” he said. He urged party activists to win a ward in Brighton and Hove and change lives.